World Junior Championships starts next week and all discussions about it actually make me think of a sad thins. How many of those great children who compete (and even win) at junior level then have lots of struggles and almost disappear at senior level. For example, Serafima Sakhanovich. I thought this girl has everything to be a next star…..but growing up was ruthless to her. Growing up and problems with technique, disappointing start of the season and two changes of coach in one year. But somehow Serafima manages to skate a solid free program at the Russian Cup Final. Is it a sign that things are going better for Sakhanovich? I hope so. The theme of tears suddenly appeared, when interviewer and Serafima were preparing for a conversation at figure skating Academy of St. Petersburg – in the locker room behind the wall a girl was crying after a failed training. Do you often cry when something does not work out? Serafima: Yes … I understand that it is bad, it is wrong, but I am a very emotional person. If I’m having fun, I laugh out loud, but if I’m sad, I’m crying. I rush from one extreme to another, but I can’t be calm. Does it affect you a lot? Serafima: Yes, earlier it did. Fell from a jump and started to cry, skating near boards. Now I’ve changed. If a do an element and it doesn’t work out I just get angry inside. And with this anger I try to force myself to concentrate and do better. Before the long-awaited good performance in Saransk It was a failure at the Junior Championships. How did you manage to recover in three weeks? Serafima: The first week after the Championship everything was so bad that everyone was clutching their heads and did not know what to do. They called my mother to trainings because I could do nothing. Absolutely nothing. And when my mother came, I suddenly realized that I’m doing bad not to myself, but to her. And I started to work. Then began to gain shape. Evgeni Rukavitsin was helping, mom was helping. Did you have an anticipation that you will succeed at Russian Cup Final? Serafima: Yes, I had it. The mistake in the short program was very unexpected, because before the start I skated it constantly clean at trainings. I watched the video after and saw that I had a bit different entrance into the jump, not as usual. I had a different trajectory, and it’s very important. Hence the mistake. And then … If in anything hadn’t worked out in the free program, I would have been very disappointing. Your mom brought you to the skating rink? Serafima: Yes. She has skated herself, but not for long. She broke collarbone and finished. And I was brought to the rink when I was seven years old. Serafima: That is why no one wanted to take me (laughs). Only Alina Pisarenko took. Probably saw the potential in me. Do you remember your first lesson? Serafima: I remember! Oh, and how I looked at my first appearance on the ice…..Imagine a soft terry burgundy dress, Jackson boots, Gold Seal blades. Alina Yurievna was amazed so much, her mouth probably fell open (laughs). Serafima: Yes-ah! A child went on ice for the first time in skates of an Olympic Champion. The coach did not understand what happened, why a child has come equipped like that. And mom, can be said, was giving the last for my figure skating classes. When did you realize that skating in your life it’s serious? Serafima: It does not come at the click. You get used to this process smoothly. Maybe, only now I understand that figure skating it’s serious. Serafima: I’ve always liked it. Especially, when it worked out (laughs). When I won something. At ten years old I started to jump all triples, and people around was talking: wow she’s so small. And I liked it very much. Everyone like to win, but not everyone like the process itself. Fall and fall at trainings, to fall painfully – do you also like it? Serafima: Yes … I like to overcome myself. Didn’t work out, fell once, twice, three times. And then it worked out and I did it! And the next time I did it even more confident! And it’s a small victory for me. With such small victories I improve. And I like it. Serafima: Yeah, it’s painful … You know, for some reason, people think that I have never had a serious injury. I just never told about it. At my first Junior World Championships it was terribly painful to jump flip and lutz. When we arrived home and I had medical surveillance, it was found out that I was competing with two broken bones in my foot. At the Grand Prix Finals I chafed a leg. To such extent that it was no longer a simply corn, it was flesh. At the beginning of this season I withdrawn from Grand Prix, because I fell and got three hematomas on my hip. But it’s all tempers. Many people think that for children everything come easy. This is probably not your case. Serafima: Everyone can see the result, but no one sees the training. They think: she is so small and jump cool, everything is so easy for her, bla-bla-bla, well done. But in fact I had five trainings per day then! Barely could left the ice. But of course everything was easier then. first of all, morally it was easier. You go and do what coach told, without hesitation. And now everything is perceived in a different way. What coach say shuffles with your own thoughts. You start to think, to doubt, to worry…. Does growing up expressed in something else? For example, whether you have to limit yourself in food? Serafima: Oh yeah! And not in sweet, I do not like it, and not in fast food, I generally hate it. But good meat, pasta, potatoes, all such fried, that I loved very much! My dad is a very good cook, and that’s all he cooked just delicious! And now I can’t eat anything of this. I eat fruits, vegetables, boiled fish. It’s good that my dad can make it tasty. Once Julia Lipnitskaya admitted that if she had been told that someday she will have to limit herself in food, she would not have believed it. Serafima: I didn’t believe too. My mother is sitting on all the internet forums, so there she subtracted about me that someday I will gain weight. And I was very thin and dry. And I was saying “Are you crazy, you think I will ever have to skip dinner?” But in the end for two months I had to miss not only dinner but also breakfast and lunch. So, the puberty age is difficult. But it’s not in eating. It’s in my head. I started to think myself. Serafima: When I was little and trained with Alina Pisarenko, there were such situations: she gives me a task – a full skate. And I, for example, not ready. I fall from the first jump, second, she yells at me, and I’m also fall from the third. And as a result – without elements. Wasn’t even fighting on spite. But now I understand that I can’t do like that. I do worse not to coach, but to myself. Of course, the coach will simply turne away. Serafima: Well, yes, he has other skaters. And I only harm myself. So this awareness came to me with the maturation. And an understanding of how and what to do. Previously, for example, I was told “Well done, clean skate.” I didn’t even have any emotions, clean – and well. Now, in Saransk I cried after the performance … I’ve never thought that this could happen to me. I used to think that those who are crying on the ice are actors. And now I cried myself, I started to cry on the step sequence when the program was still going on. Does growing up help to understand the music? Many name Carolina Kostner as an example of excellent interpretation of the music. Serafima: It was divine, incredibly beautiful! I saw her for the first time and it was so cool! Do you have roles that you would like to play on ice? Serafima: I have never had a program in which I played someone. It seems to me that to portray the character it’s not mine. I always wanted to ask, when many skaters skate, they look on the ice, and you always look up, on audience. It’s happens unintentionally? Serafima: No, I have been taught! Choreographer Irina Sushchenko always said glance flirtatious, wink to the judges, smile, be charming – and they will put a good marks (laughs). Of course, in reality it’s not so, but these tips helped me to understand what is the connection with the audience. The last question. Two title of vice-champion of the world – do you think of it when something don’t work out? Or have already forgot about it? 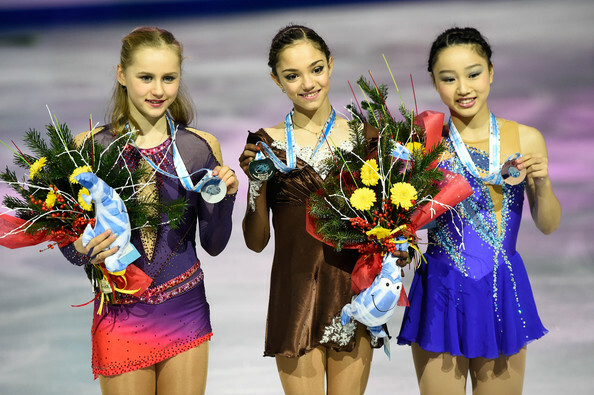 Serafima: Yes, sometimes I think all forget about me … Although I was told that it’s not like that, all remember that twice I got silver at the Junior World Championships, and at the Grand-Prix Final. But I really think that you can’t look in past. Yes, it’s happened to me – but it is necessary to live in present.? Serafima: It is necessary to set goals – but look you shouldn’t look in the future, too. Otherwise, it will end badly. Thoughts “I’ll be a World Champion” are not for me, I believe it is wrong. I want to skate clean – that’s what’s right for me. And I want to be remembered by the audience. Read also the previous interview with Serafima Sakhanovich.